This Sunday, we have a home match, at Minooka Park! Are you looking to watch some good rugby, live? Nothing to do this Saturday afternoon? 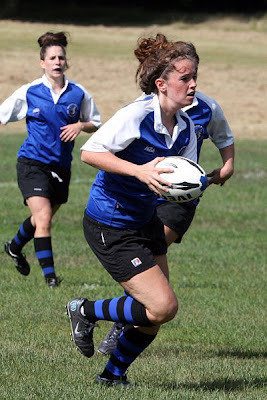 Well, you can go and support Coach Cari as she starts in her first match as a Milwaukee Scylla, our local Women's Rugby Club as they take on Des Moines Iowa. Cari will be wearing the 8-Jersey! Players MUST be there -- in kit and ready to warm up -- at 1:00 p.m.
We will be playing 2 matches on Sunday. An A-side vs. KM and a B-side (of combined KM/Brookfield) v. Fond du Lac. DIRECTIONS: Take I-94 West to Hwy. 83. Exit going north. Nagawaukee Park is on your left just passed the shopping centers. This is a county park so you will need to pay a parking fee, so please have cash on hand. Just a reminder, there is no game this Sunday. Enjoy the weekend-off!! Here are some pictures from the 51-0 victory over Oak Creek! The ball out under pressure! 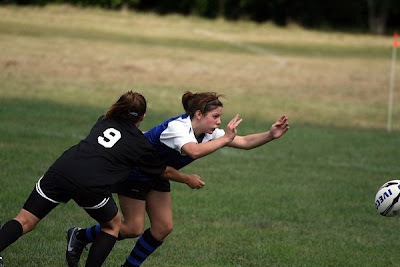 The fly-half takes it up field! A clearing kick from the full-back! We are the host team. 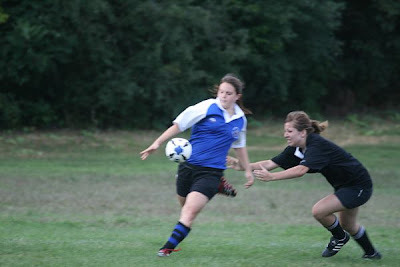 Following our match, Pius IX (a brand new club) will be playing Muskego RFC, whom we will be playing later in the season. The post-match social will take place after the second game. This is a great chance for us to get an early look at our opposition, as we will be playing Muskego in a conference match in a few weeks. Also, let's be supportive of Pius, as they our our newest club in the conference and we want to be sure to be social and supportive of our new team. 4. Turn right at E Sunset Dr -- park entrance is on your left. Continue towards back of park, the filed will be on your left. Again, this is a Waukesha County park, so please be prepared to pay the parking fee or to buy a county park sticker. 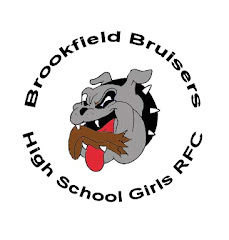 The Bruisers fell to Catholic Memorial in the innagural Founders' Cup, 39-10. 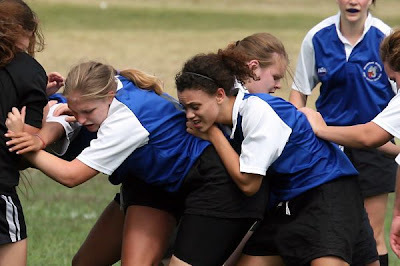 The Bruisers' two tries came late in the match as Senior 8-man, Emily, dotted down twice in the closing quarter of the match. 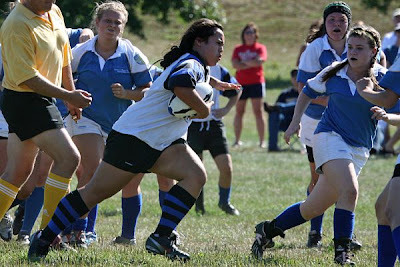 In this photo, Talia, Sophomore prop, takes the ball up into opposition on one of her two inspiring carries up the field. The Founders' Cup is on offer each time Brookfield plays CMH. There are no more scheduled opportunities for the Bruisers to regain the cup. However, the possibility exists that we will meet during the play-offs if the brackets work to our favor.